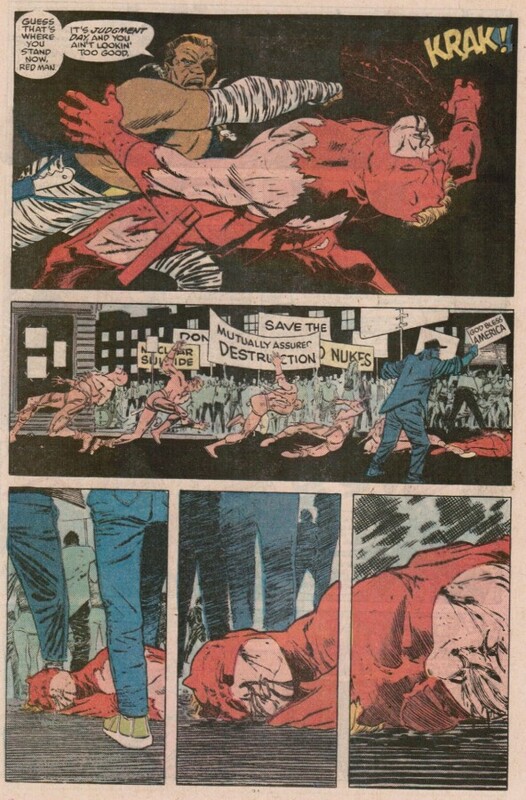 scans_daily | DAREDEVIL #260: A brawl at a peace march! "rule" is beat on him a bit then let the next one beat om him. Typhoid intends to finish him off. 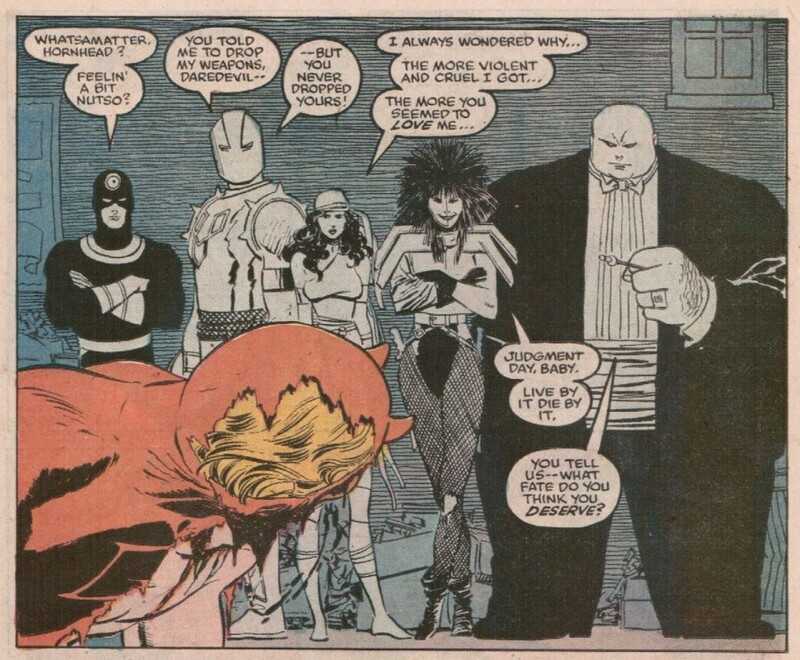 Oh, look, someone is saying the superheroes are just as bad as the bad guys. At least they are recognizing Daredevil as a superhero, which is a start. Second: Bushwacker. He could work either in the "Daredevil" or "Agents of SHIELD" TV series. 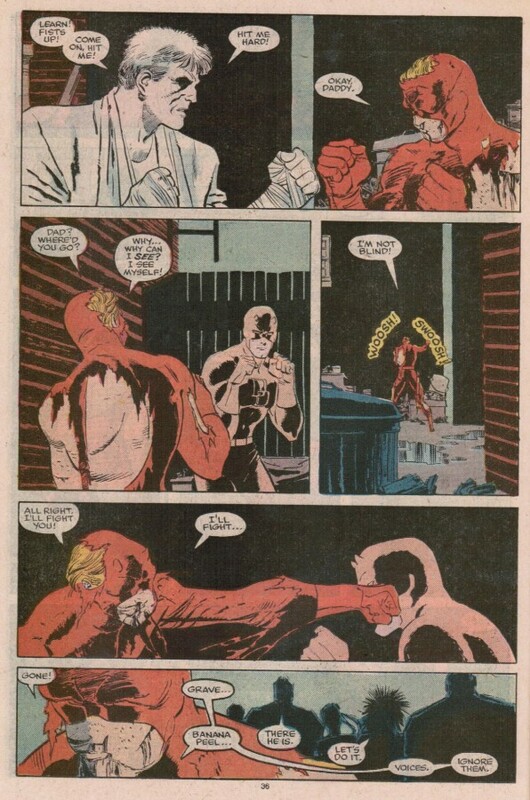 His radar sense scrambled, Daredevil almost attacks a blind man. Because irony! The Atomic Bomb is a dicey subject. But even more so in the 1980s for some reason. Probably Ronald Reagan talking about the "Evil Empire." The people of Israel wanted Albert Einstein to be their first president. He turned them down. I thought it was because he didn't speak Hebrew, but I've also read it might have been more than that. "Yes, I wanted to use my super-sense powers and ninja skills to avengers my father's murder and fight evil, but things got so violent!" Number 3: Ammo! 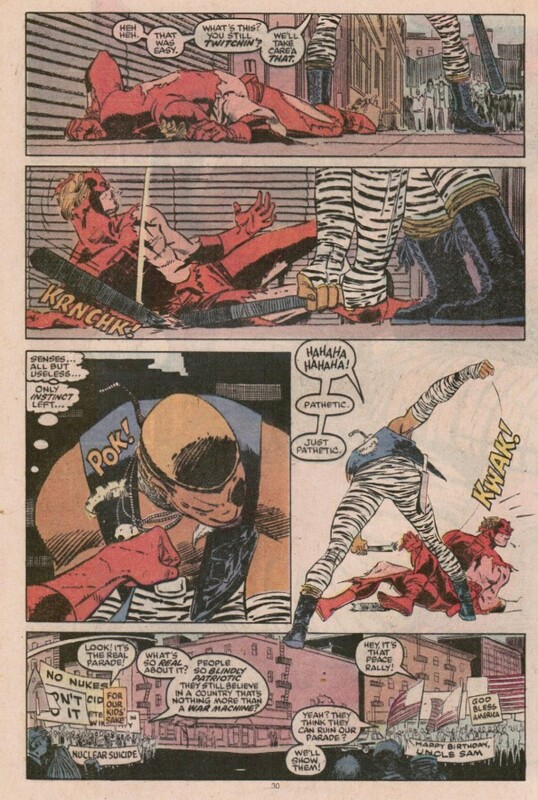 He appeared in DAREDEVIL #252 as a would-be warlord when everyone thought Nuclear War had started. 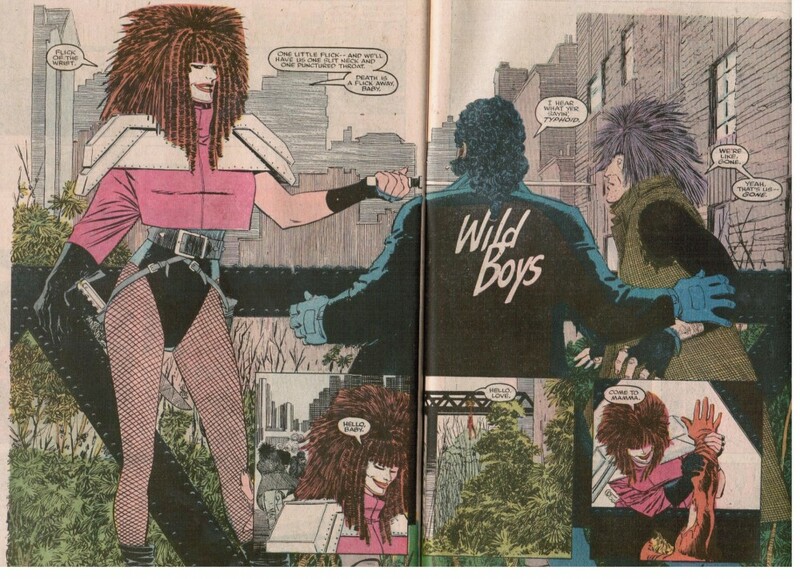 It was actually Apocalypse attacking New York in X-FACTOR #25, but the public didn't know that. Oh, no! A brawl at a peace rally! 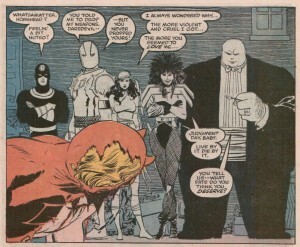 Because Ann Nocenti isn't very subtle. 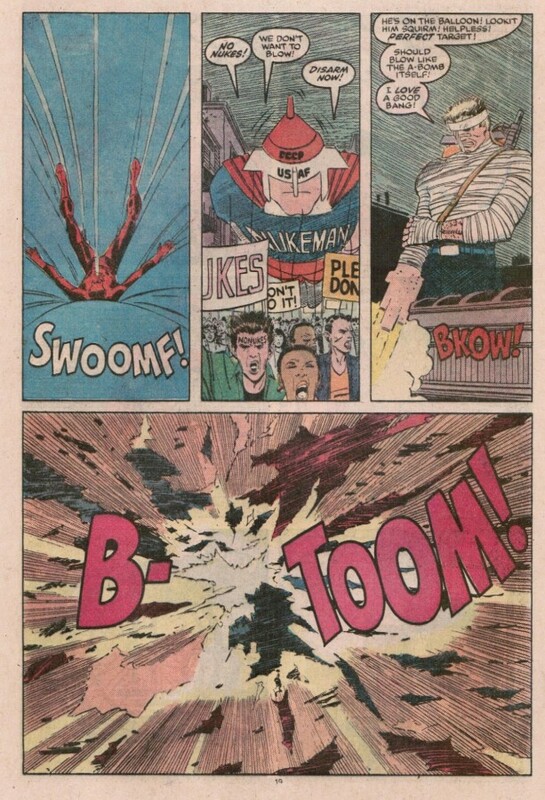 "Yeah, I could stop this riot but... superhero stuff!" 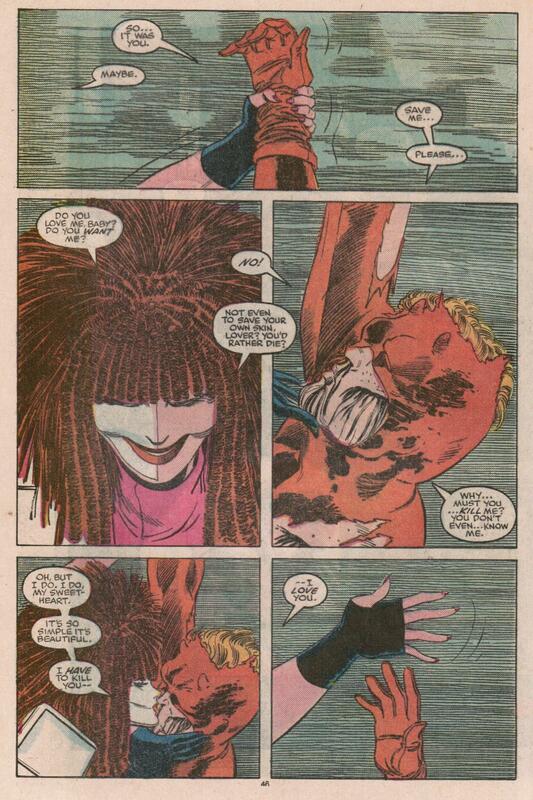 Does Ann Nocenti not like Johnny Storm? The Russians influencing American politics? You'd never hear crazy theories like that today! Hallucination time! 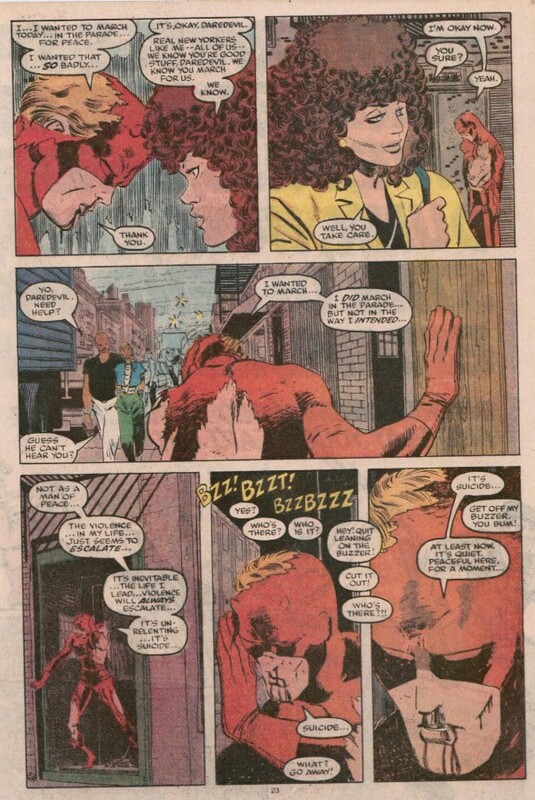 I'm not quite sure how Daredevil hallucinates, but whatever. DD gets beaten on by the Wild Boys, Spit and Jet. They are criminals who are (somehow) even dumber than Turk. Despite his state, DD throws garbage at them. They are about to throw him off a bridge when Typhoid appears. 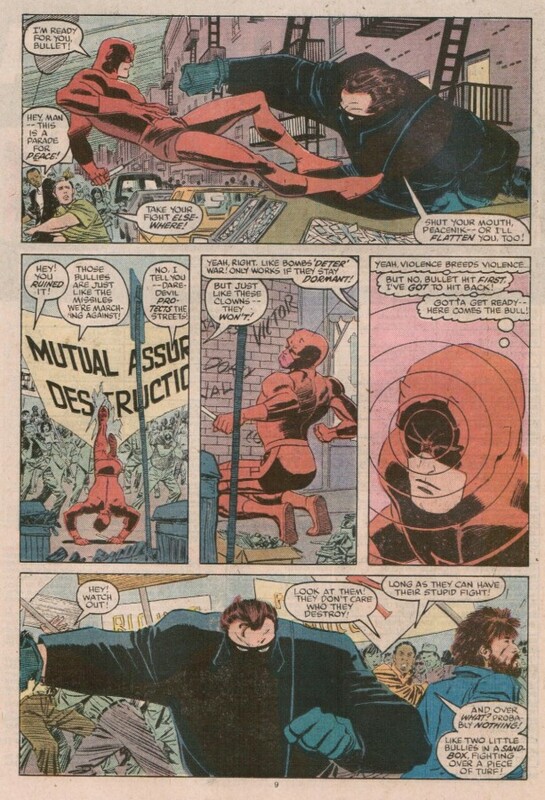 Part of Typhoid's motive here is she found herself unable to kill Daredevil since the "Mary Walker" persona has fallen in love with Matt Murdock. Which was part of the plan, but not totally. Mary doesn't know Matt is Daredevil, but Typhoid does. 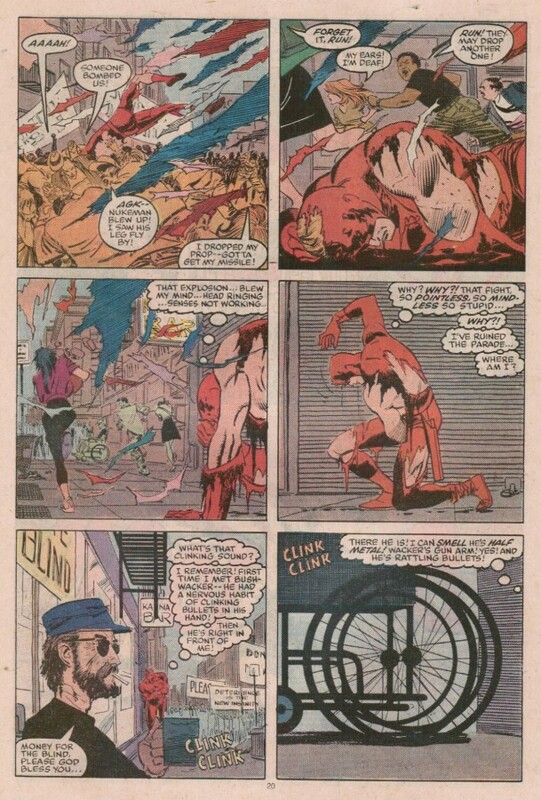 Daredevil comics are weird. There are two pages I think were supposed to face each other. 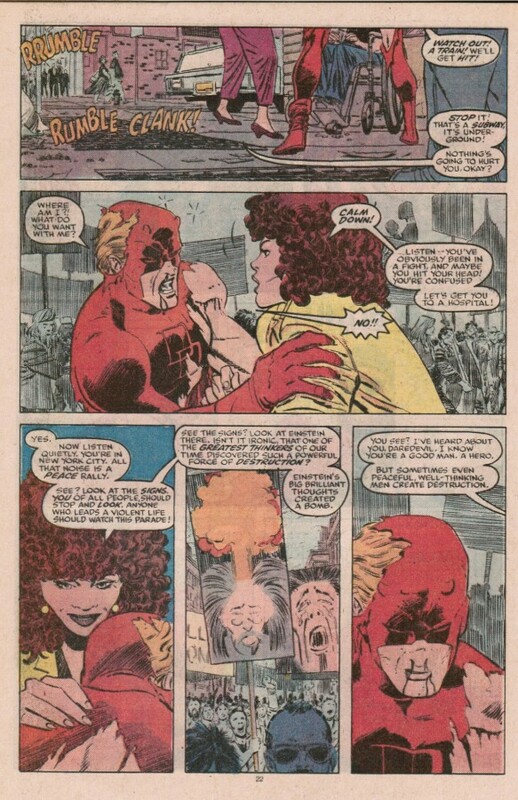 Here's a link to a page that has that image, which includes more info on Nocenti's run. I've always liked Bushwacker for his creepy fleshy gun hand. It's like something out of Videodrome. 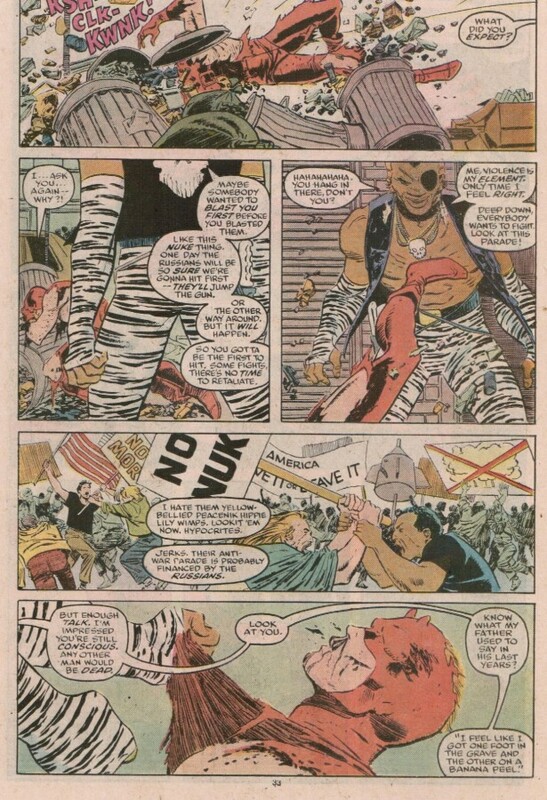 And yeah, a brawl at a peace rally is possibly the most Nocenti thing ever! 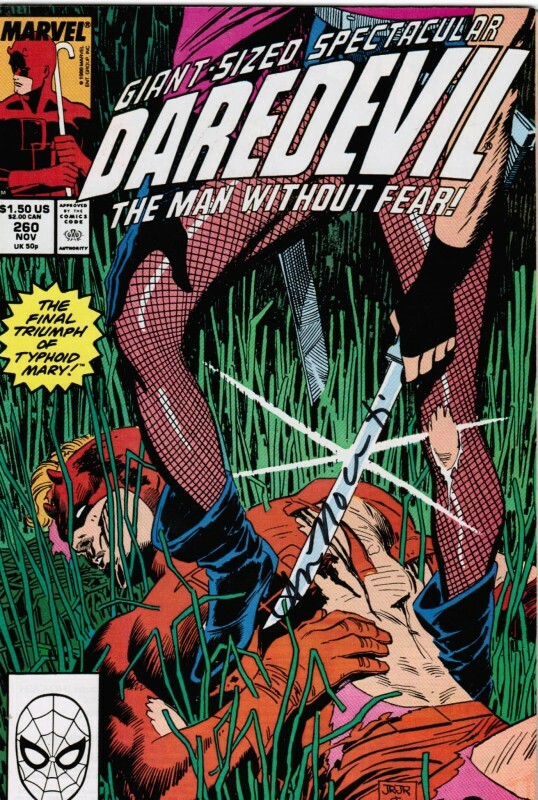 I loved Daredevil's tie in for the X-men Apocalypse event. It was so realistic for a superhero world. It is always so funny how New Yorkers treat DD. Matt wanders around in his battle torn suit, a little crazy, and they're like "oh hey, man, you do good work." 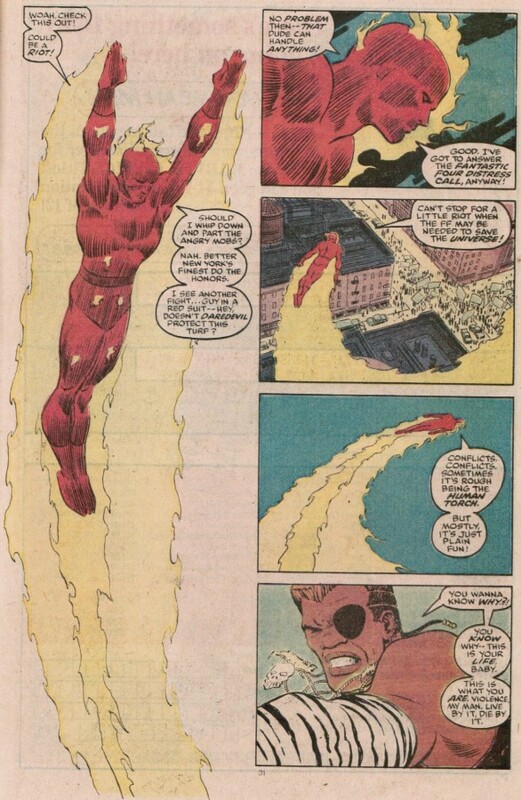 Johnny Storm and the FF's celebrity crazy lives in a completely different world.